The basic materials for a praise hoop are not that difficult to get hold hold of, if you have access to a shop that sells fabric, or craft materials. 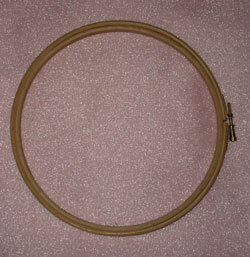 The basic frame of the praise ring is an embroidery hoop, the old fashioned wooden kind will do nicely. Loosen the screw and the inner part will fall out. You need to do two things to this inner part i.e. attach the ribbons or streamers and attach some fabric for a cover. There is a handle at the side of a praise ring. This is made by leaving a gap. In other words the ribbons or streamers do not go all the way round and the fabric does not totally cover the front edge. It is probably better to put the fabric on after the ribbons, but even if you do that it is a good idea to measure the fabric against the embroidery hoop before you put the ribbons on so you can cut it to size easily. If you tack a hem in place along one edge (I prefer the selvage where possible as there is often less bulk) and then put the fabric in the embroidery hoop and try holding it. You can then adjust the handle to the right size and trim the fabric to fit. Now take the fabric out and sew the hem very neatly. This is the best time to add any embroidery to the fabric. The next stage is to add the ribbons or streamers to the inner ring. The easiest thing to use are the Christmas decorations that are like long fringes. The top part is all one piece that can be glued to the ring. These tend to moult easily and often look best with more than one layer. They may need to have extra layers added as time goes on. Some of the ones from internet suppliers suggest that they use 5 layers of these fringes. Like any Christmas decorations used for craft work they are best value just after Christmas and then are not available until autumn. The next stage is to glue the fabric cover in place. If you then put the outer ring back on it will help hold the fabric in place while the glue dries. Once the glue is dry take the outer ring off again so it can be decorated. This is normally done by wrapping ribbon or other narrow strips of fabric or trimmings around it and gluing them in place. 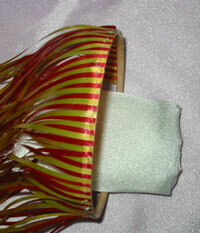 This one has the same ribbon wrapped around the outer hoop as was glued to the inner hoop. A long piece of gold ribbon was wrapped round the outer hoop after putting glue on it. A small gap was left, and when the red ribbon was added it covered the gap. folded sufficiently so it can be pressed to create a neat tape. 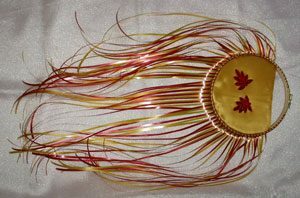 The cover can be decorated in a variety of ways. Trimmings can be glued or sewn on or both. This praise ring has 2 red sequined trims. They are supposed to be leaves or flowers but they also look a bit like flames. It is truly amazing what can be made from items available in an ordinary department store. including how to make what they call a praise hoop.